Reducing energy use in your home is one of the best ways of reducing your carbon footprint while also improving your own comfort. But where to start? You can phone them on 0808 808 2282 with details of your home. After a 30-minute dialog they will tell you what your energy usage over the year is likely to be. This is based on their computer model (RdSAP) and allows you to compare their figure with your actual energy bills. This is a key starting point, as it shows you where you are on their A to G home energy rating (Similar to A-G home appliance ratings). While this is not an Energy Performance Certificate (EPC), which costs about £220 (April 2017), it does show if your energy use is excessive. An alternative is to go on-line and fill in the form to get a similar result. In addition to this rating, you get recommendations as to what you can do to improve the energy efficiency of your home, with an estimated cost and a potential saving. Home energy Scotland has a list of people in your area who have carried out work to save energy in their homes, or generate renewable energy using devices such as solar panels. This also includes installations of heat pumps, which while not renewable devices, are listed as such. (Wind power is also included, but it usually makes more financial sense to contribute to larger sized installations than to have your own). You can go on-line, put in your post code and find homes nearby that you can phone up or visit. The third area where Home Energy Scotland can help is through providing interest free loans of up to £15,000 for home energy efficiency improvements and £17,500 for home renewables. These must be paid back over 5-12 years. 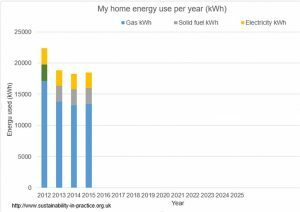 You will benefit from the subsequent savings in energy and may benefit from Feed in tariffs (FITS) or Renewable heat Incentives (RHI) if you install home renewables. You will however bear the whole capital cost. The organisation has a large bank of pamphlets and information sheets, which they can supply, to give guidance on various aspects of home energy efficiency. Historic Scotland has a number of useful guides for the renovation of old buildings. Their staff also stage courses for architects, building surveyors, tradesmen and the public on how to make old buildings more energy efficient. On these courses and at conferences, for old and historic buildings, they emphasise the need for breathable insulation for walls, ceilings and floors, to avoid condensation in wall or roof structures. For bathrooms and kitchens, where the warm, high humidity air causes vapour to flow from the room through the lath and plaster ceilings and wall linings, this is sensible. The vapour needs some way of escaping or condensation will occur within the wall structure. Porous materials like rock wool, glass fibre or natural breathable insulation materials should be used in these situations. Where the lath and plaster is removed, this can be replaced by insulation foam, sandwiched between aluminium foil (e.g. Kingspan insulation), followed by plasterboard for fire protection and wall lining. To date, Historic Scotland will not accept this, so not only do people become confused with the message, but very effective modern insulation materials are not being recommended. This is a pity. In my own house, I have effectively created a well-sealed insulated box, which sits within the granite walls. This is made of Kingspan and plasterboard. A 50-100 mm airspace between the granite and the insulation allows air to flow through this gap to keep all the structural timber dry and free from rot. There has been no instance of condensation in the walls since this was completed six years ago. 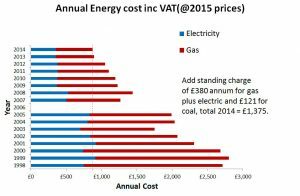 The government requires utility companies to spend a proportion of their income on energy efficiency measures under the Energy Company Obligation (ECO). Using an insulation contractor to do the work, they may approach you to insulate your loft at no cost. This may seem too good to be true, but it allows the utility companies to meet the government’s required quota. I thought I was fortunate to benefit from such an offer, until the clerk-of-works for the contractor climbed up to my loft, took one look at our partial loft floor and complicated combs, and hurriedly left saying “no-can-do”. To qualify for this offer, the loft must be unfloored, free from stored junk and easy to insulate. Home energy Scotland would again advise on whether you are likely to meet their requirements. By contacting Home Energy Scotland, you will have found out if you have scope for saving or generating energy. The next step is to decide what to do. If you can find a home energy efficiency consultant, who has a building surveying background and knowledge of tradesmen work, get them to go though your house suggesting what needs to be done. This will save you carrying out bit-by-bit modifications on a trial and error basis. If they can be a clerk-of-works for subsequent work as well, so much the better. Tradesmen tend to just concentrate on their own work areas. A joiner may insulate and air-seal a room with care, for the seal to be destroyed by a plumber or electrician fitting pipes or wires. A knowledgeable tradesman, who is prepared to coordinate the job, may be the best you can hope for. Since tradesmen making holes in your property walls is the major risk, you can tell them that you are getting the house pressure tested following the work done. 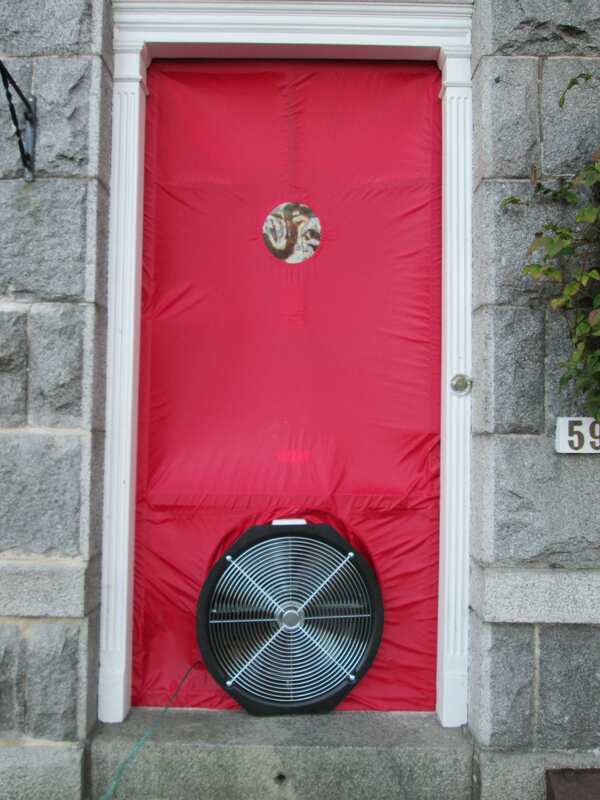 If air leakage is excessive, the final payment sum will be reduced. (I did this with our kitchen fitter. He was not happy, but he did seal any holes and the kitchen is now nice and cosy). 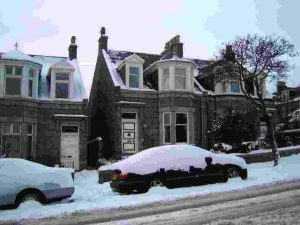 In 2006 we bought a traditional granite house, built in 1897 (See photo), with the intention to upgrade its thermal efficiency and comfort at the same time as redecorating rooms and fitting an en-suite and new fitted kitchen. To reduce our energy use we have been renewing windows and doors, sealing holes, installing insulation, and putting in new fires and a multi-fuel stove. The attached file Building Refurbishment is 77 pages long and includes many drawings and photographs. 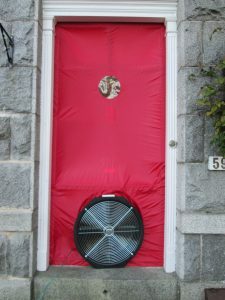 It describes why such houses are hard to make energy efficient, explains the science behind air leakage, heat and vapour movement and then goes on to describe how tradesmen and I tackled the work. I explain why I chose certain products, what went right and what went wrong, followed by assessments of the final result. The actual energy savings achieved are shown and the improvements costed. To determine the costs, some came from actual invoices, some from Spon’s Architects and Builders price book, 2006, while some are from my own guestimates. 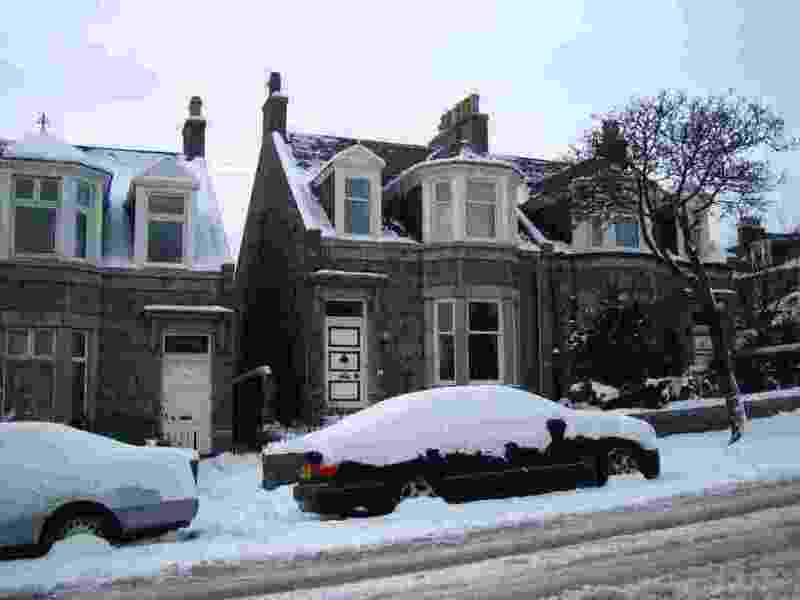 Refurbishing old houses like this to improve their thermal efficiency does not come cheap and is not financially viable by normal accounting methods. However, to achieve a comfy house and to reduce our fuel use and carbon footprint, refurbishment must be tackled. It is hoped that some of the ideas to “systematise” the work may both reduce costs and give home owners and tradesmen a steer as to how to proceed. At the end of the report, I make some comments that government should consider if they really are committed to reducing the carbon footprint of the traditional housing sector. This project is now complete, so a shorter 13 page “Short Guide to improving the energy efficiency of a traditional stone house” BuildingRefurb-ShortGuide-25-02-15 has been produced, to give residents a steer as to how to go about such refurbishment. Air leakage via timber floors, trapdoors, windows, front doors, service holes and open fire places caused the major heat loss. Sealing these was a quick win. Evaluating benefits from the various actions is difficult to quantify as many changes were made simultaneously. Apart from installing a condensing boiler, zone control on the radiator heating system, secondary glazing and possibly the wood stove, most other jobs, if done by tradesmen, would take 30 plus years to pay off. By doing the work myself, pay back was quicker but still a long time. We have never regretted doing the work, or paying for the materials and tradesmen, to give us a a more comfortable home. The house is not a warm house throughout. The zone heating warms rooms when we are in them, so the other unoccupied rooms are cool to cold. To accurately calculate how much energy in the home you are using annually, use actual fuel bills. By clicking on building energy calculator, you can calculate the energy use in your home using data from your energy bills. In community buildings, or even in your own home, it is good to keep a log of annual energy use. If people see the bars of a graph reducing in height over time they will try to modify their behavior to use less energy. 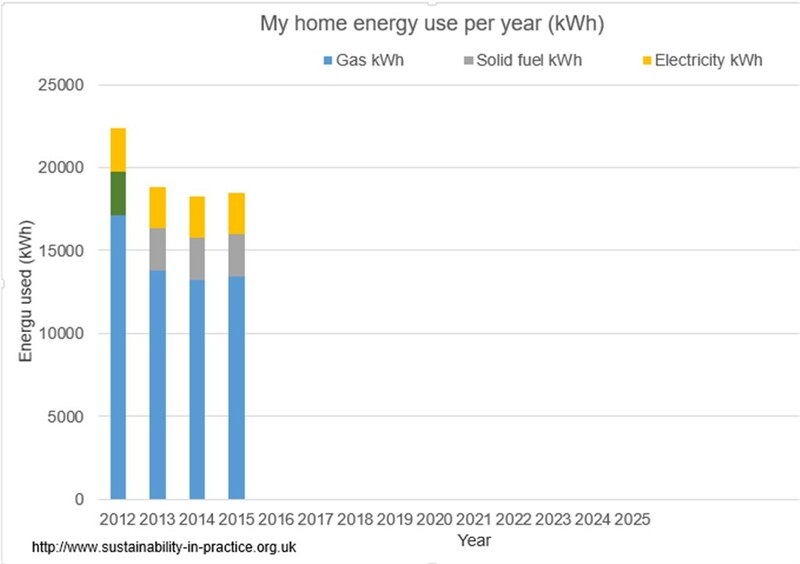 The spread sheet GraphEnergyUse-2016 has been set up to make this easy to do. All you need to do is click on to the link, download the spreadsheet to your own computer, then fill in the necessary data. The spread sheet consists or a sheet with information and calculations along with an accompanying graph. The sheet is protected, but with boxes to allow you to input your own data. All the items in blue text can be altered. If you don’t use some of the fuels listed, go to the graph, highlight the graph legend showing the fuels used and delete these unused. Once you have input your own data and produced the graph, print it out and display it on a notice board for others to see. This will show others your annual energy use year on year, which, as a building’s energy efficiency is improved, should show diminishing energy used over time.If you are competent with Excel, you can unprotect the graph and modify it to suite your particular needs. If you get into trouble with doing this, simply download a new sheet from the website and try again. While energy for heating and cooking are the major issues when considering efficiency measures, minimising water use also helps. A range of plumbing devices are available to minimise water consumption. Roaf, Prof S, Baker, Dr K, Peacock, A, (2008). Pp. 53. Evidence on tackling hard to treat properties. School of built environment, Heriot watt University and SISTech Ltd.